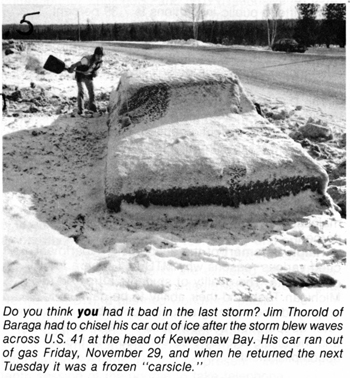 Michigan Tech students drove a Jeep into Douglass Houghton Hall in 1951. 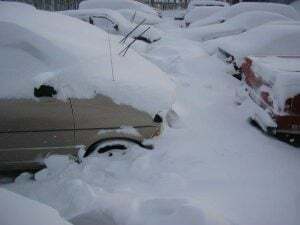 April brings with it April Fool’s Day pranks, but Michigan Tech students have been known to get up to some mischief all year round. 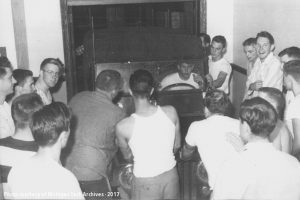 In June 1951, the men of Douglass Houghton Hall drove resident Guenther Frankenstein’s Jeep up the stairs of their dormitory and into the hallway. Although the guys thought the prank was a riot, Frankenstein recalled that the college administration wasn’t laughing and wanted to expel him. They eventually settled for probation. 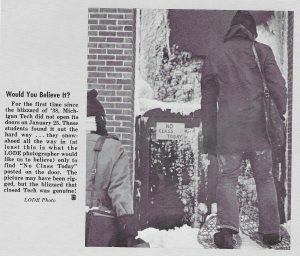 The next year, fourteen Tech students–also residents of DHH–spent the night in jail for a risque joke that maybe wouldn’t fall into the category of “crazy smart”: along with more than fifty of their peers, they besieged the student dormitory at the St. Joseph School of Nursing in Hancock, hoping to come away with lingerie. Standing outside the school’s Ryan Hall, they shouted their demands for underwear to the young women residing within. Some even wandered into the furnace room before police arrived and arrested members of the group for their disorderly conduct. Eventually, a judge ordered that all charges against the men be dropped. 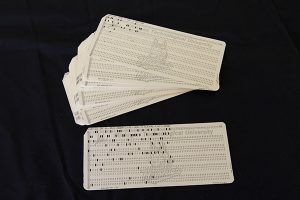 A set of computer punch cards. We’ve heard rumors about other pranks that have taken place on Tech’s campus over the years, including some involving tweaks to computer programs on punch cards, but the files of the archives are remarkably bare. Do these tales bring back memories of your own college escapades, whether they took place five years ago or fifty? We’d love to hear your stories! Photo from the 1980s of a Michigan Tech mining engineering student. Huskies of yesterday and today will often mention “the ratio,” referring to the disproportionate number of male students compared to their female counterparts. 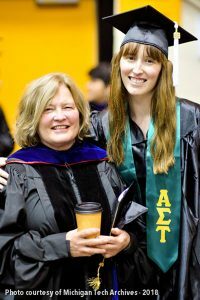 According to the most recent statistics published by Undergraduate Admissions, women constitute some 28.2 percent of the Michigan Tech student body. This number may seem small, but it disguises a mighty tradition of accomplishment, innovation, and trailblazing. In honor of Women’s History Month, let’s take a whirlwind tour through how the lives of women at Tech have looked and changed over the years. Unfortunately, in such a small space as this, we can never do true justice to their stories! 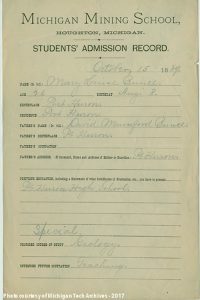 Michigan Mining School admission record for Mary Louise Bunce dated Oct. 15, 1889. Just four years after the Michigan Mining School was founded, at a time when coeducation was uncommon, the first women enrolled. 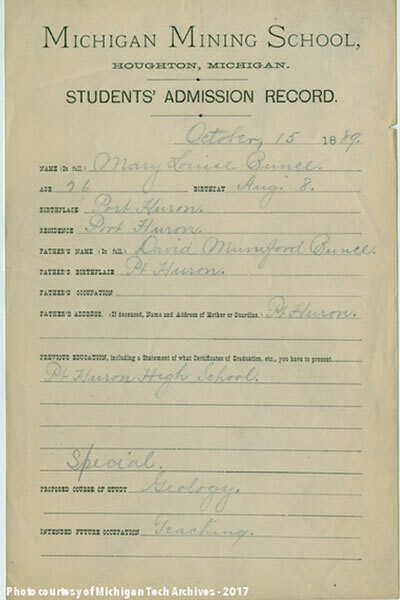 Both Margaret McElhinney and Mary Louise Bunce taught in the public schools of Houghton, and in 1889 they became students themselves again, taking classes in chemistry and geology on a part-time basis. The number of women enrolled remained small for many years, but their presence, once established, persisted. 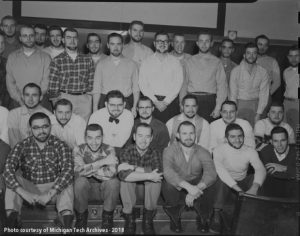 In 1933, Margaret Holley broke new ground for female Huskies by becoming the first woman to earn a bachelor’s degree from what was then called the Michigan College of Mining and Technology. Just a year later, she followed up her degree in general science with one in chemistry, then proceeded to a master’s program in general science again. 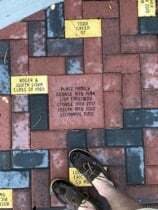 So significant were Holley’s steps at Tech that she later served as a trustee and, under her married name of Margaret H. Chapman, helped to start a long-running scholarship fund in her name to support women’s education at Tech. Women in a Michigan Tech lab. The year that Margaret Holley finished her first bachelor’s degree, Tech enrolled a record-breaking number of fourteen “co-eds,” the nickname given to female students at the time. World War II changed not only the number of women at Tech but also the nature of what the college permitted them to study. Historically, women had been admitted to programs in science and some facets of engineering; Ilmi Watia, for example, received a civil engineering degree in 1938. Tech discouraged women from enrolling in certain mining engineering courses and highly technical programs. With young men away at war in vast numbers, however, the United States and Tech both found a need for women to step into roles that they had not otherwise filled. In 1943, the college promoted a new war training program for women that started to break down some of these barriers. The courses were intended for “all young women who wish to serve their country in this emergency by training themselves for essential jobs that carry pay commensurate with their vital importance,” according to a marketing brochure. Women completing the program–whose length varied from eight weeks to a year, depending on the course of study chosen–could immediately enter government or industrial work in roles ranging from the more traditional secretary to engineering technician, full professional practitioner (if they already had degrees in other subjects), and airplane ferry pilot. 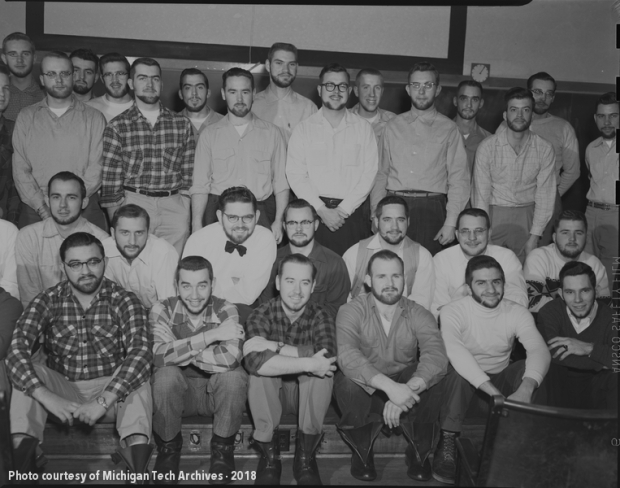 All courses carried college credit, and women who did not find the curricula of the war training programs to their fancy were encouraged to pursue the full range of coursework at MCMT, including technical fields. The Smith House, which was used by female students. From there, slowly and steadily, the population of Tech women continued to grow and blaze trails. 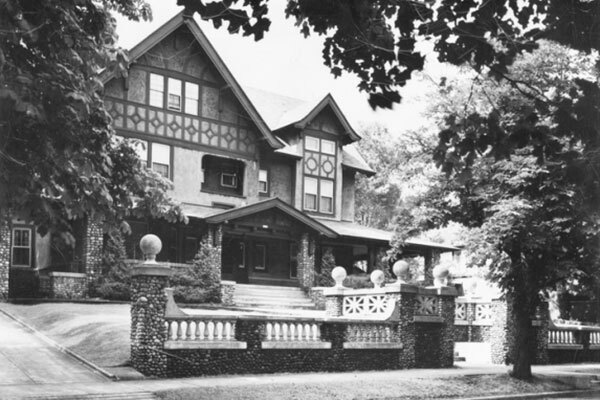 In 1945, a women’s dorm opened in the house formerly occupied by Kappa Delta Psi. In the years that followed, the former residence of the Fred Smith family was converted to women’s housing, and, at various times, female students also resided in houses known by the names of Pryor and Robinson. The first woman to earn a degree from Tech in metallurgical and materials engineering graduated in 1947; the first female mechanical engineer at the college finished her program in 1948. 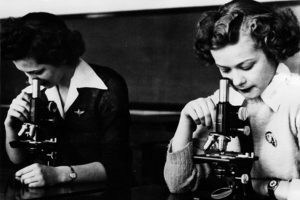 By 1952, the college had begun efforts to recruit women in earnest, publishing pamphlets explaining the scientific and mathematical careers open to them with a degree from Tech. 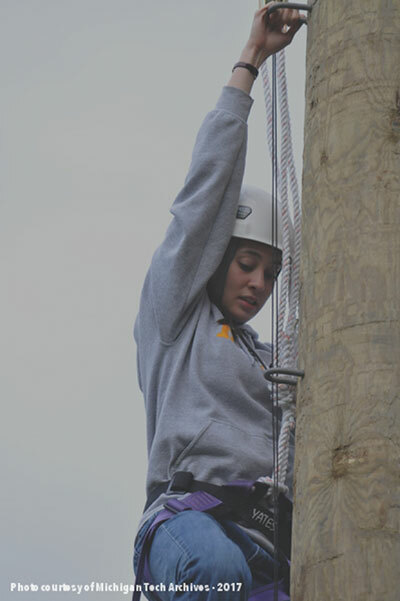 Women answered the call and enrolled in many courses of study, including forestry, biological sciences, and all varieties of engineering. By 1968, 8.5 percent of Michigan Tech students were female, rendering the college officially coeducational by the metrics of the time. 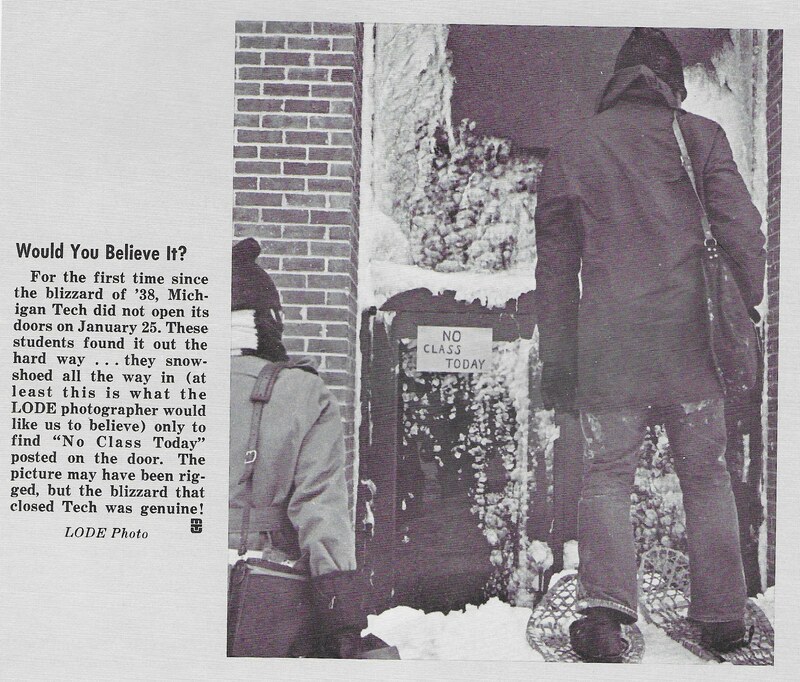 That year, Co-Ed Hall (now known as McNair) opened to alleviate a shortage of on-campus housing for women. A few years prior, Wadsworth Hall had begun to offer a few spaces to female students. Douglass Houghton Hall, on the other hand, remained all-male until 1973. 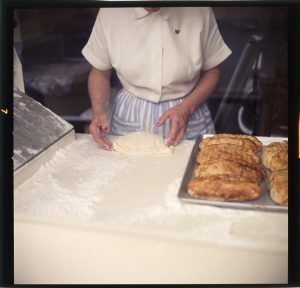 Women’s involvement and visibility on campus continued to grow through the remainder of the 20th century. 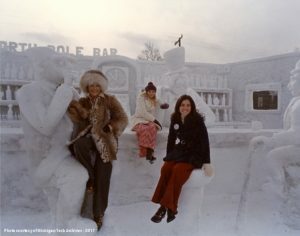 In the 1970s, for example, the first female cadets joined the Air Force ROTC program, and the first national sorority and women’s teams in nordic and alpine skiing came to campus. From 1975 to 1982, Michigan Tech’s nursing program graduated nearly 300 hundred women, representing a larger proportion of female enrollment than perhaps any other degree program on campus. 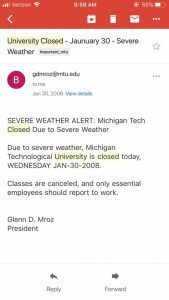 Groups like Woman Sphere and Tech Women’s Connection formed to advocate for women’s issues and initiated important dialogues in the Michigan Tech community. 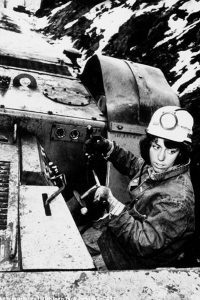 Meanwhile, in 1993, a team of Michigan Tech women won the Intercollegiate Mining Competition, demonstrating both their prowess at mining techniques and the college’s historic roots. How appropriate for Michigan Tech women to literally break ground. In 1969, Dean Harold Meese wrote to the women of Tech that, in spite of being vastly outnumbered by men on campus, “you traditionally have more than overcome these odds academically by earning better grade point averages. 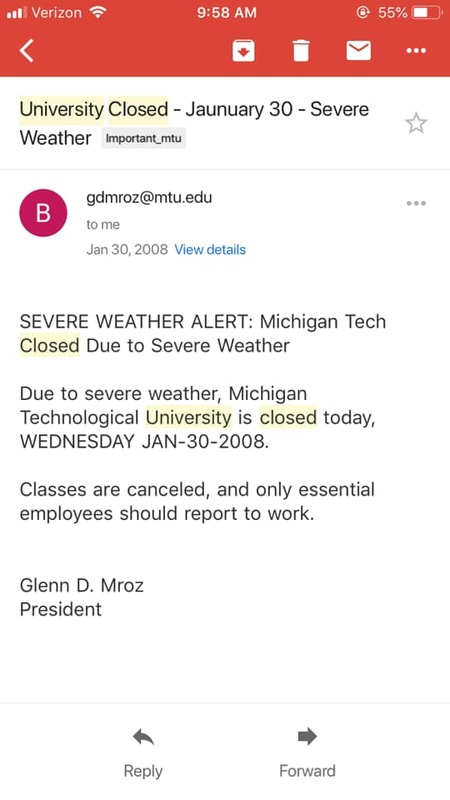 This, I feel, is due to your above average intelligence and your strong desire to become a well educated person and to find a meaningful way of life.” Whether they joined the Husky family in 1889, 1959, 1999, or 2019, women at Michigan Tech have always exemplified a passion for knowledge and a dedication to leaving their mark on the world. They are making history, one day at a time. Were you lucky enough to spend a summer in the Keweenaw? 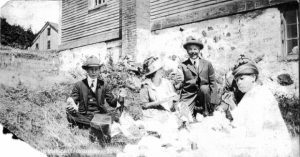 Top answers: Summers in the Keweenaw were full of work and fun. New question: What types of volunteer activity have you been involved within your community?